South Korean Defence Ministry via GettyU.S. 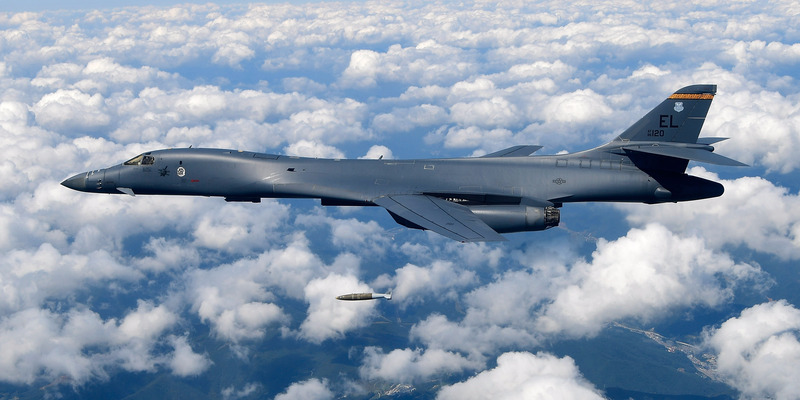 Air Force B-1B Lancer bomber drop MK-84 bomb during a training at the Pilsung Firing Range on September 18, 2017 in Gangwon-do, South Korea. U.S.
An American Airlines pilot that saw a UFO over the Arizona desert has been revealed to be a former B-1 bomber pilot with 20 years of flying experience. The description matched the one given by the pilot of another plane that reported the UFO, who also said that the object was extremely bright. A former B-1 bomber pilot who now works as a commercial aviator for American Airlines has spoken out about his recent UFO encounter over the Arizona desert. Blenus Green and his co-pilot were flying an American Airlines Airbus A321 over Arizona in February when they were told by Albuquerque-based air traffic controllers that a flight ahead of them had reported a flying object not on radar. The controllers asked him to radio them if he saw anything similar. Shortly afterwards, Green saw an object, according to recordings of his conversations with the controllers. Green was recently interviewed about his experience by a local Texas TV station. “Albuquerque Center asked us if we could look and just be on the lookout and see if we see anything, and I’m like ‘ok,'” Green said. “So, sure enough, I was looking out the windscreen because I wanted to see if it was there and yeah, I did. I saw it,” Green said. He noticed that the object was bright in areas where the sun was not reflecting off the metal. “Normally, if you have an object and the sun is shining this way, the reflection would be on this side, but this was bright all the way around,” he said. “It was so bright that you really couldn’t make out what shape it was,” Green said. With 20 years of flying experience, much of which was spent as a B-1 Lancer pilot in the US Air Force, Green said he wasn’t scared, but interested. “I was just really fascinated by it. Just trying to figure out what it was because it was so out of the ordinary,” Green said. Bob Tracey, the vice president of the company that owns the jet that first reported the object, said that his pilot also told him that the object was extremely bright after he was debriefed.